June 20 is International Surf Day, a day that celebrates surfing and the ocean through beach clean-ups and restoration projects, followed up a surf. 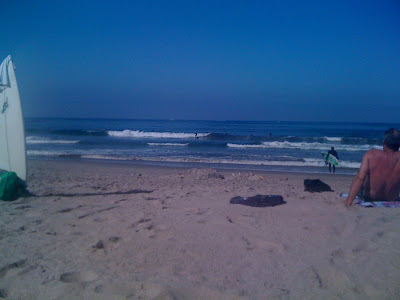 There were multiple events organized around the world and in Southern Cali including Surf 24 in Huntington Beach (with surfers in the water every hour for 24 hours + an event filled weekend of movie screenings and live music). We decided on the lower key Santa Monica event instead. Before the beach clean-up at 9am, we had some home cooked breakfast. My usual weekend drink of choice, mimosas. My favorite breakfast dish, the french toast. Try to select good bread such as brioche, French toasts or Texas toast. The batter included eggs, milk, allspice, sugar, salt and pepper. Asides from using the right bread, you should top the french toast with the real deal such as real maple syrup and Plugra butter. Homemade breakfast of french toast and hash brown is a great way to start the day. In Santa Monica, we started clean-up of the beach and found some disturbing items in the sand such as a broken tequila bottle, plastic bottles, lots of plastic bags and cigarette butts. 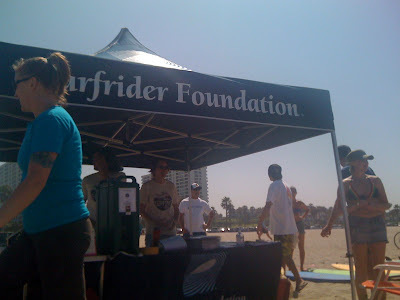 If you'd like to help clean up your local beaches, contact The Surfrider Foundation. After clean-up, we suited up and hit the waves. Aquasurf was there to offer free lessons, ZJ Boarding House provided free board/wetsuit rentals and Arbor offered Firewire demos. The waves in Santa Monica in general are less than ideal but it was still fun to be out there and be a part of the event. After surf, I was starved and went in search of some meat. We ended up at Bondi BBQ in Venice Beach. The restaurant offers BBQ fare and is named after the famed beach in Sydney, Australia. It's a casual spot with surfboards hanging on the ceiling and had a rustic feel inside with wooden tables. Bondi has a lovely front and back patio that makes a good alfresco dining spot. This joint is supposedly run by Aussies but no one there seemed to be from down under. In addition, they do not serve alcohol.. which IMO is kind of un-aussie-like.We decided to split the BBQ for Two for $33.95 that includes a half BBQ chicken, half rack ribs, shrimp, two sides and garlic bread. The baby back ribs were pretty good. They were tender and coated with a BBQ sauce that had just the right amount of sweetness. I liked that the BBQ sauce wasn't lathered all over the ribs. I prefer ribs that are cooked and seasoned well, instead of masked by too much sauce. The half chicken was a bit of a mix. The dark meat was soft and flavorful, however the white meat was dry. The garlic bread seemed to be made from a hot dog bun. One of our two side was shoestring fries but these were definitely thicker than shoestring fries. It's a pity because I was really looking forward to some skinny fries. Our other side was the creamed spinach which was rather bland and definitely needed some salt. Thankfully, the shrimp was delicious. There were ten shrimps and they were grilled with a nice char and cooked with butter, herbs and topped with a squeeze of lemon. The shrimp was nicey cooked and juicy. The ribs and dark chicken meat were the winners but the white meat and tasteless creamed spinach were a let down. I would return for the ribs and perhaps the meat pie. However, it's hard to eat BBQ ribs without beer, by the beach, in an Aussie joint no less.